We found ourselves in downtown Raleigh on a Thursday evening, walking about Fayetteville Street Mall, looking for some reasonably priced grub for the crew. This was another spontaneous outing while we escaped from an eerily clean house for a last minute showing. There were lots of food trucks and people selling their wares. Live music was pulsing in the air and my children spied a booth hosted by the Carolina Hurricanes. 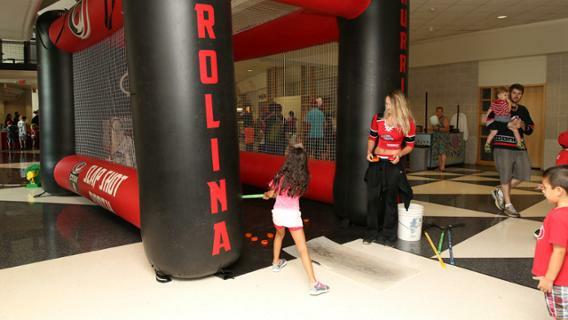 It was an inflatable slap shot zone where kids are given five attempts to shoot a puck and hit winning targets. The prize was a red t-shirt. 8/9 O’Melias gave it a go. Maddie was our only winner. Gabby passed on making her best slap shot attempt. I was secretly relieved. I knew it would be a struggle for her to one-handedly grasp the hockey stick and make contact with a puck sitting on pavement. We moved onward. We contemplated our need for ice cream. It was then that Gabby decided, yes, she needed to step up and give this hockey challenge her very best go. Ugh. My feelings were so very mixed. I was thrilled she was being courageous, yet concerned she would be discouraged or suffer embarrassment. I stood and watched as she stepped right up to the young man running the show. He handed her the stick. We want so much for our children to succeed. We want to save them from the hurt, the humiliation, the rejection. “Maybe I should go help her.” My fear bubbled over. “Don’t you dare.” His words came so unexpected, cutting decisively through my doubts and uncertainty. I stood stock still, willing her towards success with all of my being. She swung the wooden stick and missed numerous times. She made contact and the puck slid a few measly feet. The booth attendants grew uncomfortable watching my girl struggle. They saw how lefty was drawn up, useless, just along for the ride. They didn’t know how to cheer or how not to cheer. They felt awkward. They felt sympathy. They offered my Gabby a free t-shirt for her efforts. She declined. She knew she had not achieved anything remarkable. Good job, I said, I’m so proud of you for trying. My eyes smarted. Tears threatened. This girl of mine is braver than her mama, I thought. Always has been. Don’t you dare help her. Don’t you dare swoop in and come to her rescue. Let her struggle. That was the bottom line. She will never achieve her potential for independence unless you allow her to wrestle with challenges, flounder in uncertainty, and fail at the difficult. So just a couple of days later my resolve to interfere less in her daily struggles was tested. A letter from Betsy, her very favorite therapist in the whole world, arrived. She carried the envelope around with her, as all kids do their most treasured possessions. She plopped down on my bedroom floor and began to read the 3 page letter, as I watched. Yes, she was just as pleased with its contents as she had been the first time she read it. Satisfied, she began to slide the pages back into the envelope. No dice. She tried time and time again to get those sheets of paper to clear the confines of the receptacle. She held the envelope with her foot to stabilize it while she every-so-carefully reintroduced the pages. Denied. This was insanity!! How long had it been? Twenty minutes? I can’t watch anymore. It’s too much. Everyone has their limits. Her patience, her perseverance…it was breathtaking…it brought me to tears. She problem solved. She separated the 3 sheets. She folded the first one and holding the envelope with her foot slid it in. Success! She repeated this process with the second page. Yes! She had only the final page to go. The envelope was fuller now. The third folded page was meeting resistance. She continued to wiggle and change the angle….. Finally, the task was complete. A sigh of relief escaped me. I commended her for her great effort. I explained how things were always going to be harder for her, but if she didn’t give up, she would accomplish great things. In that single, excruciatingly long moment of testing, it was confirmed, that choosing to stand by and watch, might be the most powerful decision I can make in my daughter’s life. Please pray for this helicopter mom. This was very powerful for me, thank you for sharing Kelly! I always look forward to reading your updates on Gabby and your family. This post brings such warmth to my heart and has such parallels in my own helicopter parent struggles with our daughter (and our other kids too). I really enjoy the way you write as well. It flows effortlessly from your words into my thoughts. Why, some might ask? Because you frame your thoughts in proper grammar, so my brain spends almost no time deciphering 25 sentence paragraphs trying to follow the train of thought. You use many tools to create emphasis and inflection, and I just love it. To stop reading! Our 5 year old daughter had her first seizure in March of this year and was diagnosed in July with Cortical Dysplasia in her right frontal lobe. We are so new to this whole journey and the testing, the medication, the side effects…Selah was labled refractory to medication last month and we are waiting to Hear back from the hospital about a date for surgery sometime in January. Thank you for your honesty and transparency! God knew I needed to find your blog! I showed Gabrielle’s pictures to Selah and she was so encouraged knowing she’s not alone. We will be prayingfor your familyand daughter now every time we pray for our own!